Today's post is for our Let It Snow challenge over @ ABC Challenges. We're asking to see all of your gorgeous snow, snowmen or snowflake creations this week. You have until Sunday, December 16. 2012 @ noon EST to link your card to our blog. 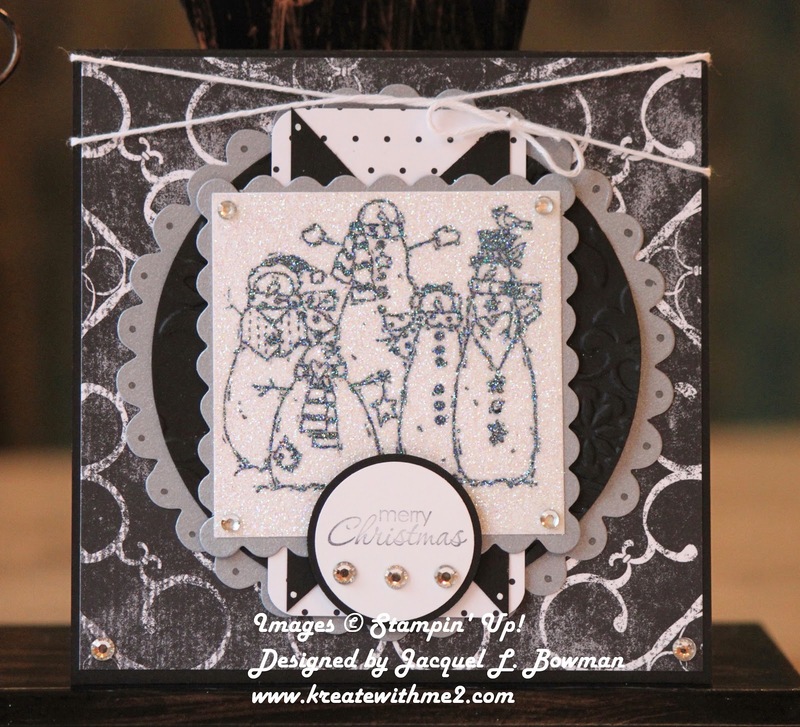 Fabulous Let It Snow card, Jackie! I always love all your cards!! I think I will enter my snow globe card in this week's challenge! Love how you used a black and white theme. One of my favorite snowmen stamps of all times. Awesome layout too. Thank you so much for sharing your wonderful inspiration with us at 4 Crafty Chicks. Hope you have an amazing week. Great card, Jackie. The snowmen are adorable. Thank you for playing along with us at ABC Christmas Challenge. Stunning card! The black and white colour scheme really make it stand out from the crowd! The snowmen are gorgeous! Thanks for playing at Sweet Stampin' this week. I love the snow...the texture is great! Thanks so much for playing with us at Just Us Girls! Thanks for joining our FOREVER FRIENDS MONTHLY CHALLENGE - CHRISTMAS. Wishing you a great CHRISTMAS TIME!! Hi! Nice black and white card!! Thanx for joining us at the FF fortnightly challenge with the christmas theme! Such a dramatic color combo! Lovely! Thanks for playing our snowman challenge at 4 Crafty Chicks, great job! WOW Jackie, I love that stamp and I haven't use it this year!!!. Nice to see it in this beautiful card!!! Flaky Friends is such a cute stamp. Glad to see it being used on this cute card. Hi Jackie, ooh love this one! Stunning layout and colour choices. 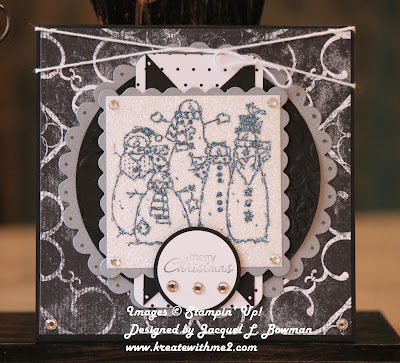 Unusual to see a black and white creation for the holidays, but it works! Great job! Thanks for joining @ CCC! Very pretty card! Love the snowmen and the color combo. Thanks for joining us at Forever Friends. Really cute...I love the black and white...plus the great glitter! Thank you for playing along with us at Forever Friends...Happy Holidays to you! Very unique xmas card and what a cute image too.